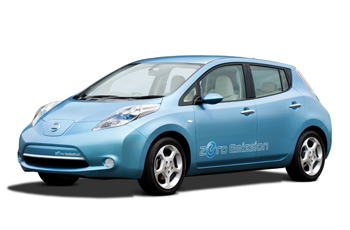 The Nissan LEAF electric car was announced on 2 August 2009 by Nissan Motor Co. Ltd. Nissan claims it to be the world's first affordable, zero-emission car. The car is designed specifically for a lithium-ion battery-powered chassis, and is a medium-size hatchback that comfortably seats five adults and has a range of more than 160km (100 miles). Nissan CEO Carlos Ghosn has stated "We have been working tirelessly to make this day a reality - the unveiling of a real-world car that has zero - not simply reduced - emissions. It's the first step in what is sure to be an exciting journey - for people all over the world, for Nissan and for the industry." The LEAF is slated for launch in late 2010 in Japan, the United States, and Europe. Additionally, Nissan LEAF is expected to qualify for an array of significant local, regional and national tax breaks and incentives in markets around the world. As an added benefit, because the vehicle has less mechanical complexity than a traditional gasoline-powered car, Nissan LEAF is designed to be friendly to the wallet as well as to the environment. Nissan LEAF is powered by laminated compact lithium-ion batteries, which generate power output of over 90kW, while its electric motor delivers 80kW/280Nm. This ensures a highly responsive, fun-to-drive experience that is in keeping with what consumers have come to expect from traditional, gasoline-powered automobiles. A combination of Nissan LEAF's regenerative braking system and innovative lithium-ion battery packs enables the car to deliver a driving range of more than 160km (100 miles) on one full charge*. Extensive consumer research demonstrates that this range satisfies the daily driving requirements of more than 70% of the world's consumers who drive cars. Nissan LEAF can be charged up to 80% of its full capacity in just under 30 minutes with a quick charger. Charging at home through a 200V outlet is estimated to take approximately eight hours - ample time to enable an overnight refresh for consumer and car alike.